Lawn Care & Landscaping St. Louis | Dowco Enterprises Inc.
For nearly 40 years Dowco has been providing residential lawn maintenance clients in St. Louis, Missouri with top quality lawn and landscaping services that they can depend on. If you're not sure if the brown spot is from lack of water, the dog, or a disease you can rely on our team of experts. Dowco's irrigation division is ready to help you manage your lawn, flowers, trees and shrubs to keep them healthy. Keeping your beds tidy and weed free can be very time consuming. Dowco's robust training ensures that no matter which crew is on your site, you'll have an end result that you're proud of. When the snow falls, Dowco is the number one provider of snow plowing and ice control services for the Chesterfield, MO area. Investing in your landscape not only provides a place for you to relax, reflect and entertain. It also adds to the value of your property. Tired of unreliable providers & DIY tutorials? The Dowco Difference is the extra mile, the gravy, the cherry on top, the above and beyond, and all the other perks you deserve. We bring your empty trash cans to the garage & newspaper to the door. We knock before we start services and before we leave. We politely drive clean trucks and arrive in uniforms. We do weekly training & build leaders. 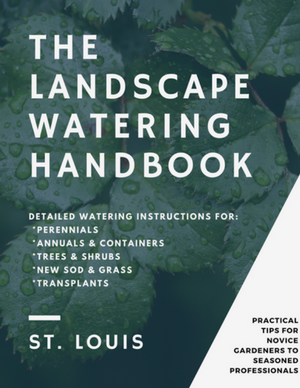 Read our free watering guide designed specifically for St. Louis landscapes. Never worry about over or under watering again! Detailed watering instructions for perennials, annuals, containers, trees, shrubs, new sod, seed, and transplants. Download here.